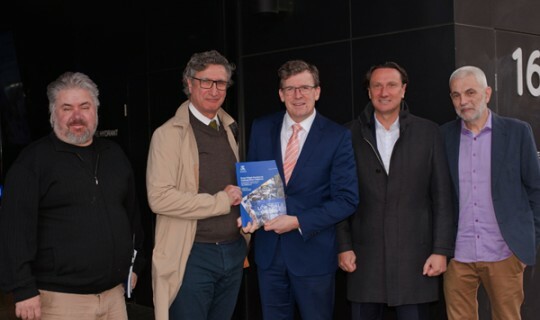 The Federal Minister for Citizenship and Multicultural Affairs, Alan Tudge, visited the Greek Community of Melbourne (GCM) and met with the President Bill Papastergiadis, the GCM Secretary Costas Markos, the Greek Centre Director Jorge Menidis and Professor Nikos Papastergiadis, one of the authors of the recently released report From Ethnic Enclave to Cosmopolitan Cultures: Evaluating the Greek Centre for Contemporary Culture in the City of Melbourne. The Minister and his staff were given a brief tour of part of the Centre and an overview of its function and operations. “Over 1400 people per week use the Centre to meet, to educate and be educated, to entertain and be entertained,” explained Jorge Menidis. The Minister was suitably impressed with Centre and in particular with the just completed Level 12 facility that will house the GCM’s library. In presenting the University of Melbourne report to the Minister, Professor Papastergiadis highlighted the significance and importance of not only the Greek Centre but also the Lonsdale St Greek Festival. He noted that the report was a template for other communities to use in analysing their own activities. “We welcome the opportunity to meet and work with the Minister in this key portfolio. As the Minister acknowledged, the Greek Community is a great example of the successful Australian multicultural model” said GCM president Bill Papastergiadis.